It's the slow season, so a lot of transfer news shouldn't be expected and with the world cup starting, a lot of things won't become clear until after. A lot of clubs are, understandably, holding on to talents with a view to selling them after the world cup when the values rise. After the last summer transfer window, when Valencia signed Gabriel and Murillo in the last week and Pereira and Guedes on loan on the last day, we have been quicker off the blocks this time. 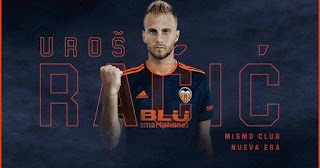 Uroš Račić is the first signing of the summer (if you discount Kondogbia.) He signs on a 4-year contract with a 100 million euro release clause. He's more of a defensive midfielder, who also plays in the centre. As such, he's more of a back up for Coquelin, who in turn is second in the ranking to Kondogbia. This is pretty much a "depth"/"prospect" signing along the lines of his countryman Maksimovic rather than a high level signing to improve the squad. He looks pretty decent in the official highlights reel but I'd never set too much store by those as they can make any player look like Messi. Other than that, like most of you, I'm in the dark and we'll have to wait and see. The club's attempts at signing young "prospects" on the cheap haven't been good in recent years. Bakkali looks like he's returning to Belgium. Medran is a goner. Maksimovic has been good as a free signing, but understandably wants more game time and would need it to develop. Santi Mina is the only one approaching a success and it's questionable whether 10 million and two disappointing previous seasons even counts to get here. This will be the first signing of the Longoria era. The other hope is that it will not affect the club's policy of bringing talented youth like Alcacer, Gaya, Lato, Soler and Ferran into the first team. The other transfer moves are still to be confirmed. Cancelo continues to be linked with various Italian clubs, though the club seems to be holding out for 40 million, having rejected a 15m plus Marko Pjaca offer. Kevin Gameiro is the player most linked with us, with various sources claiming it's a done deal but official confirmation has yet to arrive. He looks most like to replace Zaza, who continues to be linked with a return to Italy. I'd edge towards keeping Zaza, but I can understand the situation. Marcelino prefers flexible players, who will be happy to sit out games when necessary. Zaza has repeatedly shown that he's unhappy at both not starting and being subbed off. Players in similar situations, like Medran and Matt Ryan, who have shown that they are not happy to be rotated, have been quickly shown the door for the good of squad harmony. The other player most linked with us is Daniel Wass of Celta. I'd sign him like a shot. Decent player, La Liga experience and versatile as he can play centre midfield, right wing and right back. The asking price seems to be 7m, but inexplicably, we seem to be pushing for less, offering 5m for a player who has a 25m buyout. I'd just pay the 7m and be done with it. We are due a windfall from the Champions league. 15.2m fixed rate, at least 16.6m more based on previous ten years, which could rise to 18.8, at least 10m more from TV rights, gate receipts of 8-10m, merchandising adds more and 900,000 euro per point gained in the group stage. Looks like at least 55m even in a bad year. The two other pieces of good news related to that are that we will not have to pay the 23m EU fine this year and will have further time to fight it and that, conversely, PSG will have to raise 60m in transfer sales before 30 June and may therefore have to sell Guedes quickly. Interesting summer ahead, but don't expect too much transfer news for the next 4 weeks.